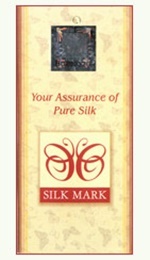 We were the first and only online silk store to be certified by Silk Mark Organisation of India for assurance of pure silk. 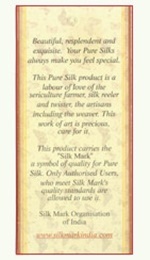 Silk Mark ensures 100% natural silk in all products under a Label. 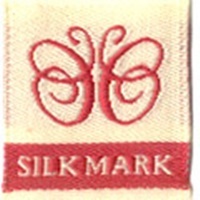 This means a Silk Mark product contains only pure silk in its base fabric allowing ornamental Zari thread work as extra warp and weft at loom stage or after loom. Tamperproof high security hologram is used for Silk Mark. 1. A paper hang tag on which a high security hologram is affixed. The hologram contains a unique serial number which can be identified for its Authorised User and period of use. A hang tag is mandatory for use on each piece in case of Sarees, Garments, Bed covers & Curtains. The hang tag is used on lot basis for silk yarn and small value items such as stoles, scarves and cushion covers. For Silk Fabric roll, a paper tag at one end is used. 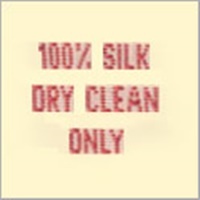 Sew in label is used on cushion covers, stoles and scarves and is optional on dress material, saree and garments.